Port Isabel Lighthouse stands watch over the South Texas coast. Whenever I travel, my sightseeing priorities are old buildings and local food specialities. Civic pride is evident in architecture and appetite, so I find it a great way to connect quickly with a city or town. A late summer trip took me about as far south in Texas as one can go, to Port Isabel and South Padre Island. I had never visited, and, having only heard about the island’s appeal to spring break thrill-seekers, was unsure what awaited me there. Before I crossed the Queen Isabella Causeway to the island, I passed through the center of Port Isabel. Though road-weary after the long drive from Austin, I pulled over. In the center of the square was a green hill topped with a white lighthouse. The lighthouse was clad in scaffolding, a sign of coming improvements. (The lighthouse reopened in January after extensive repairs.) While small when compared to others I’d seen along the Atlantic Coast, its petite size added to its charm. The U.S. government built the Port Isabel Lighthouse for $7,000 in 1852. Its light, provided by 15 lamps and 21 reflectors, shone for 16 miles. The new brick structure signaled the town’s growing regional importance as a cotton shipping port. By the decade’s end, $10 million worth of cotton exports passed through Port Isabel annually. The Civil War stymied trade, although Port Isabel’s proximity to Mexico appealed to blockade runners. The lighthouse sustained minor damage when Confederate Col. John S. Ford buried its light and lenses (which were never recovered), but it resumed operations shortly after the war’s end. Equipment and building upgrades came, too (except for another hiccup in the 1880s, when the government discovered it didn’t hold the title to the land). The lighthouse’s working days were drawing to a close at the turn of the century. Lighthouses with more powerful technology eclipsed their older, smaller counterparts. Railroads between Texas and Mexico reduced the need for commercial shipping. Port Isabel’s beacon operated until 1905, when its light was extinguished. A designated state historic site, the lighthouse opened to the public in 1952. Today, it remains a symbol of community pride. Port Isabel’s Chamber of Commerce houses its offices in the reconstructed Keeper’s Cottage. Movie nights on the square bring families out to watch a film projected on the side of the structure. 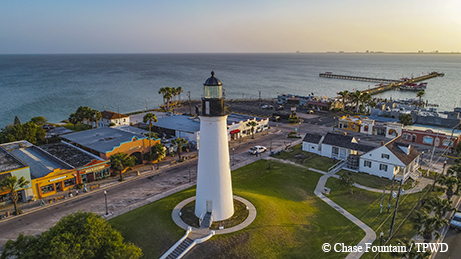 A witness to hurricanes, war and modern development, the Port Isabel Lighthouse stands tall, connecting visitors and residents alike to the history of this Texas coastal town. Don’t worry, I didn’t forget my other priority. Although captivated by the charm of the lighthouse, I indulged in plenty of local, fresh-caught seafood. Check the park website (tpwd.texas.gov/portisabellighthouse) for more information about events and activities. Port Isabel Lighthouse State Historic Site is located on the Lower Laguna Madre in Port Isabel, on Texas Highway 100.